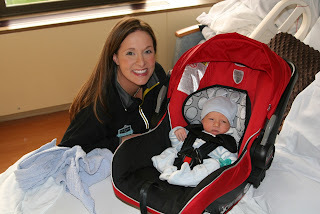 Blissful Hospital Birth With Cord Wrapped Around the Neck FOUR Times! People- I get a lot of birth stories. A LOT. In fact I get so many that sometimes I try to just read them quickly and post them up. But this story- I couldn't stop reading! What an AMAZING birth story. I love this moms personal journey. I love her thoughts on birth. I love that she is a REGULAR PERSON with two epidural/inductions under her belt who decided to have a natural birth and then did it. She earned it and she made it happen. Yes you can have a natural birth in a hospital- THIS IS HOW YOU DO IT! As I write this, our four-month-old son Dean is asleep upstairs… Not being a natural writer, I am hesitant to start the process of writing my own story…though, I truly want to share and add my experience to an online collection that was so helpful as I researched my journey to a natural delivery. Each story was different yet insightful in my discovery of the magic and strength that comes from a birth free of outside intervention. I hope my story offers a positive perspective for other moms considering this this road. To begin, let me go back to the start of my road to motherhood. My first two children, 8 and 10 years ago were scheduled due date inductions on Friday mornings. The Friday morning, looking back, was for the convenience of my doctor's weekend…oh how little I knew back then! Both were born using every medical intervention in an OB doctor's book of magic. (Cytotec, Pitocin, water breaking, IV, Epidural….) The only thing I said 'no' to was IV drugs as I am allergic to most pain killers. All in all, I had easy inductions with no pain and was even doing my hair and make-up during labor. At the time photos and looking like I had it all together were of utmost importance. Both births were beautiful and I have two healthy children. Now fast forward to the beginning of 2012, I am about three months pregnant and still if you were to ask my birth plan I would have emphatically stated, “I don’t want it to hurt…not even a little bit.” During the early stages of my pregnancy I searched for productive outlets to ready me for another child. In that vein I decided to watch the "Business of Being Born" on Netflix. Never did I imagine a simple documentary could send my solid birth plan spiraling into a tailspin. I began getting mental nudges that perhaps I had missed something in my past birth experiences? Could I birth a baby without drugs? Why in pregnancy do I not take a single Advil or sip of wine, but on the BIG day, I decide to throw caution to the wind and load up on large amounts of painkillers? How can this not significantly affect my little one? These questions swirled in my head. The big one though was…Can I do it? And so started my quest to see if a drug free labor was for me. I mentioned this new idea to my husband in passing one morning in bed. "Honey, I am thinking I would like to try a drug free birth". His reply was kind of expected. “You're crazy!” Taking these words of support, I forged on to see if a natural birth was possible. Going completely pregnancy fanatical…as we are apt to do in those long 9 months, I started reading. I poured through Internet articles, blogs and stories and finally came across a plan called 'The Bradley Method' this style birth felt right. I found a book called 'The Husband Coached Birth' and loved it. It was informative and supportive of my desire to have a natural birth with an physician attending…or life-guarding as the book calls it. This worked for my husband's need to be in the safety of a hospital and my need to have a drug free birth. My next plan was to read every drug free birth story I could find online. I hoped reading the real life pains, triumphs and struggles of women birthing naturally might shed a little light on the road that lay ahead and offering additional knowledge, or a few tips to help me achieve this new goal. The common denominator that I heard over and over is that fear equals pain. I needed to know as much as possible so to be ready to stare fear full in the face and ignore it. The big day finally arrives. After spending a week with contractions that were stronger then normal Braxton Hicks, I finally had a few that made me squat to the floor and take notice. It was 6:30p.m. the night before Dean’s due date. My husband was out at a work dinner and I was home with our two older kids cleaning up dinner. My kids noticed that I was having a few contractions that seemed more intense than usual and asked if I thought tonight would finally be the night. I said “you know, I think it just might.” Not wanting to get my hopes up too much I went back to cleaning the kitchen, feeding the animals, finishing homework and basically trying to get the house in a state that if we zoomed out…everything would be ready. Around 8:00p.m. my contractions started to get a little more intense. I decided to lay in bed on my side and see if I could get them to subside. My thought was if they went away after lying down, it wasn’t really labor. My 8 year old son decided to join me and was so cute with the contraction timer app. He instructed me to tell him each time a contraction started so he could hit the timer. 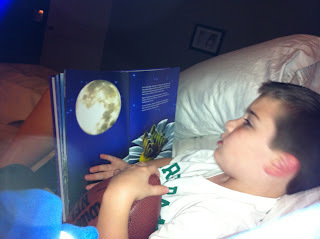 While we waited for contractions to come, he laid with me in bed reading me a book. Looking back, this was one of the sweetest moments in my labor process. Since the contractions weren't stopping and were about 5-7mins apart I called my husband and told him not to drink too much wine at his business dinner as tonight was most likely the night and I needed him to be with it. I got up after about 30 minutes of timing and went to the bathroom. While there, I had the bloody show, which I hadn't seen in my previous pregnancies so it was a bit of a shock. Gross, pretty much describes it! As I was coming out of the bathroom both my kids were hovering wanting to know why I just said gross and if the baby was coming tonight . Before I could answer, my water hits the tile floor. Both kids standing there looking at me like…what? Well, I said that confirms it. Yes, we are going to have a birthday. By about this time, my husband came home and I called grandma to come pick up the kids and our German Sheppard. She arrived and left with the clan about 9:30p.m. and my husband convinced me to go the hospital to be checked. I refused many times, but he insisted, as he wanted to be sure everything was ok. I didn’t want to go as I had a birth plan to stay home as LONG as possible and this was breaking that plan before labor really even kicked in. Needless to say, I was grumpy about this and dragged my feet the whole trip there. When we got to the hospital, we checked in and went to the “prove it" room as I was told it’s called. This put me on edge and I started to doubt if I was in labor at all. I literally started stressing…maybe I’m crazy and I’m not in labor and I’ve got everyone worked up for nothing. Turns out I wasn’t crazy, but in early labor as I was only 3 to 4 centimeters. The pain at this point was really no big deal, just really uncomfortable during a contraction. They said I could stay as I was in labor, but I knew if I stayed I would be tempted and perhaps advised to take drugs and speed the process up. I'm also certain from my reading a that women can stall or postpone labor if she doesn’t feel comfortable. I clearly didn’t feel comfortable at the hospital that early in labor and my labor had pretty much stalled out since being there. Against my husbands wishes we drove the 15 minutes home. There, he climbed into bed and I proceeded to walk around the house in the dark. My contractions starting to intensify once I got home and felt comfortable that my birth plan was back on track. When I say they intensified, I mean…"drop to the floor dagger in your back" pain. This is when I began to learn something about myself…I can’t relax through pain as so many birth coaches advocate. And so decided to fight through every contraction like a personal battle of will. I should have known it wasn't my style to become passive and put my body into deep relaxation during a contraction. Being naturally highly competitive, with a dose of ADD on top, relaxed isn't a natural state for me. I’m the person in yoga who is sizing up the competition and trying to out pose everyone. So back to the job at hand... I learned something else squatting in pain on the floor of Dean’s nursery as my cat stares vacantly at me - A contraction only lasts so long and then stops. Literally, all the pain is gone for 2, 3 or more minutes. It is heaven! I figured if I could just fight through to the next break I could do it. Just knowing the pain wasn’t forever and that I would get another calm break with no pain kept me going. 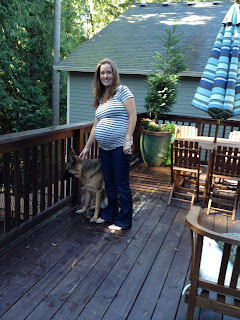 Having labored at home for 3 hours I started having contractions that caused my body to shake and my teeth to chatter. This began to scare me, as I was not mentally prepared to have a baby at home! That thought in mind, I woke my husband and stated I was now ready to go to the hospital. He leaped up and dressed while I grabbed a big pillow from the bed. I figured I’d need it for the car as the contractions were getting quite painful. The short ride took forever this time, I hunched over the pillow in the passenger seat facing the rear of the car. Was my seatbelt on?…no, but somehow dying in a car crash didn’t seem all that terrible coupled with the pain I was experiencing. We got to the hospital at 12:30 a.m. and I was having contractions every 2 mins…dropping to the floor in a crumpled squat each time. When we finally got up to labor and delivery I had a big contraction right in front of the nurses station and dropped to the floor saying “f**k.” My husband was mortified and said “honey, this is a Catholic hospital don't swear"…Let’s just say I didn’t take his advice as swearing seemed to help. 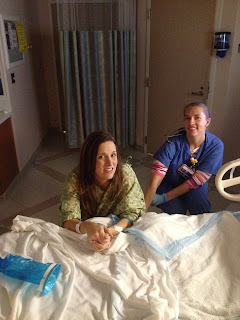 We finally made it to our room, where I put on a gown and we met the best nurse any mother could wish to have! When I mentioned that I was going drug free she simply said "OK, let me go get you a birthing ball and let me know what else you need". Fortunately it was a quiet night on the floor, so she was assigned to us exclusively. She didn’t require me to get hooked up in bed as I refused to lay on my back. I was having such back labor that the thought of lying on my back seemed like human torture. I found the most tolerable position was sitting on the birth ball hunched over the bed. Basically every time I had a contraction, my husband would have to put as much pressure as he could on my lower back as it felt like a hot steel dagger was driving into it. If he wasn’t doing that, he was literally throwing a straw with water in my face telling me to drink. He was bound and determined to make sure I didn’t get dehydrated…too a fanatical fault almost. Good thing though as I had refused to let them give me an IV. I hate needles and when they started to give me an IV port I started to feel like I was going to pass out…my nurse politely whispered to me that I could “refuse” the IV if I wanted. Thank goodness! I refused and wow how much better I felt. Oh…but then came another crippling contraction and I back to the reality that only through these contractions was our baby going to be born. Two hours after being at the hospital our replacement OBGYN arrived. I say replacement as she was not my usual doctor and I had never before met her. Since she was only required as a 'lifeguard' I didn’t really care. She did manage to anger me from the start. After I told her I was birthing naturally, she said, “Why are you doing that?” huh! Your supposed to be a doctor, aren’t I a champion for trying…to birth drug free for the babies sake?! Ugh… Another contraction quieted all debate and I promptly put the crazy doctor out of my mind and went back to work. I quickly discovered that I liked laboring on the toilet. The pressure in my backside had become so similar to taking a BM that it felt only natural and I needed to be on the toilet even if I wasn’t doing anything. Me on the toilet is where my husband had to draw the line and it was fine with me as I kind of wanted to be alone to fight the fight at this point. The nurse kept checking on me as she wanted to make sure I wasn’t going to birth our son on the toilet. I assured her I would know if I was passing something that large! My guess is I was probably in the bathroom for transition, which took around twenty to thirty minutes or so. Finally, I went back to the bed hunched over the back of it looking at the wall on my knees. No position felt good at this point, but just moving around seemed to help. It was in this hunched over position that the rest of my water broke. It felt like a water balloon fell through me and out…a very strange sensation. I immediately checked and was relived to find the fluid was clear. With no bag of water to shield me, the pain intensified further. The nurse checked me at about 4:00 a.m. after my water broke and I was having extreme pressure and a desire to push. She said I was complete and welcome to push if I’d like. THIS was the moment I thought…OMG this thing is going to come out where? Not sure why I never put this together completely, but I guess the fact that I was going to be fully present and able to feel it scared me to death. What is 7+ pounds going to feel like coming south?! My first two births were drugged so I never felt a thing and only really pushed for 5-10 minutes. This times the intensity scale was off the charts and I pushed with all I had. At first, I was afraid to push as it really felt like I was going to do…you know what on the table…and with everyone watching! The nurse kept telling me it’s a good thing, push down there with everything you’ve got and so I did. I started with the squat bar thinking it would be easier to push him out, but soon discovered after about 20 minutes of pushing that squatting is some serious work on the thighs! I then went back to a sort of sitting/half laying position with my knees pulled back to my head…pretty cute position to be in. My husband who religiously avoids anything medical had his head buried in my neck cheering me on as he and I both agreed he didn’t need to look south during this process. I really don’t remember anything anyone said, I only remember the doctor fiddling with her gloves in an odd way like I was taking too long and I remember the ceiling as I studied it tracing the lines with my eyes hoping to distract my mind from the battle my body was having with this 7lb+ baby. The doctor kept telling me to take breaks, I kept refusing as I knew the only way to make all of this end was to get it out! FINALLY after forty-five minutes of hard pushing he was crowning. I gave it one last push with every ounce of strength I had. And yes, the burning or ring of fire as I’ve heard it called was pretty right on! His head finally popped out and it turns out my excruciating back labor was explained, as he appeared face up. I then heard the doctor gasp…which isn’t something you want to hear at this moment and she said stop pushing. I could see in the glare of the light reflecting off the dark window her doing a sort of circular moment with her hand like she was cranking a wheel. My son had his cord around is little neck not two, or even three times, but four! The doctor in her twenty plus years of medicine had never delivered a baby that had it four times. He was born perfect and right on time…at 4:43a.m. on his due date! He weighted 7lbs 11oz and was 21 inches. They put my little man on my chest right away and he started nursing for about an hour…and hasn’t stopped. All in all, this was an amazing experience…something I don’t ever want to forget! Yes it was painful in ways I cannot begin to describe, but it always seemed bearable. The pain though is part of the good part as well; it made it very real and made me feel very present throughout the labor process. What got me through the tough moments was letting go of fear and trusting that my body knew what it was doing. And the real kicker for me…I knew that I couldn’t prepare and plan to go natural while involving my older kids for months in the discussion and then come game day have to tell them I wasn’t brave enough to do. For me, that would have been like training for a marathon and then not finishing!....Hell no, this girl was going to get her medal! And I did, a beautiful 7lb 11oz perfect little man. Loved this! And many of the details mirrored my own. It wasn't until my third that I decided to get serious about natural birth and prepare for it, hubby thought I was nuts, had a natural birth in the hospital (compromise with him) and we haven't looked back since. Of course the stories are not identical, no two ever are. But I was just pumping my fist the whole time because I was there! And women need to hear this! WE CAN DO IT!!! 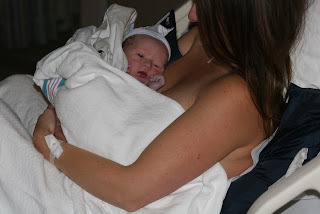 I loved this birth story, it was written beautifully and made me feel like I was there. LOL! :) With my first I had a medicated birth, epidural, breaking (the rest of) my water, IV meds, etc. With my second I got to the hospital too late and had my daughter within 10 minutes of being there. I freaked when I found out it was too late for the epidural but I felt SO proud and strong once I had her. I didn't think my body was capable of doing it without being medicated. It's such an amazing feeling! !